The National Animal Poison Control Center (NAPPC) of the University of Illinois can be reached by calling 1(900)680-0000 or 1(800)548-2423. The NAPPC is located at the University of Illinois Fees for service: $20.00 for the first five minutes, then $2.95/minute thereafter when using the (900) phone number and $30.00 per case when using the (800) number. Pet Poison Helpline, 1(800)213-6680, an animal poison control service open 24 hours for a service fee of $39.00. It is available throughout the U.S., Canada, and the Caribbean for pet owners and veterinary professionals. The Wererat's Lair (rat faqs,info,and help). Nursing Care by Mary Ann Isaksen. Helpful ratmath calculations, and more. Recommended Rat Vets—Midwest and Eastern U.S.
FRMCA-Forida Rat and Mouse Club of America. BARMCA-Bay Area Rat and Mouse Club of America. http://www.fancymice.info/ (Cait McKeown's site. Good information on mice and additional resources). RMCA Resource of Mouse FAQ's (compilation. The Ratster A Breeder an Information Directory. Mazuri Rodent Diets; offers selection of different diet types and product information for each. Harlan Global Rodent Diets; Harlan Teklad specializes in the rodent diets and offers product and data information on all their rodent diets. Oxbow Essentials Diet; Oxbow offers product and data information on their rodent diets. The Ratty Dictionary (wonderfully funny word descriptions). The Bad Rat Pledge (Contributions by many of us on the RatList). rat sauce.com Check out section on ratty breeds for color/markings. Marty Mouse House. The Famous Martin Marty Mouse (really an adorable dumbo-earred rat). Shop for cute things and read Marty's adventures! 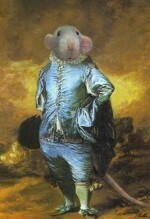 The Illustrated Rat. Showcasing the artwork of Drusilla Kehl & Matt Kaplin. Note cards, holiday cards, and prints for purchase. Introducing a rat to water fun. Also good for cooling off on hot days. Wee Companions Small Animal Adoption, Inc ( Located in San Diego, California ). Mainely Rat Rescue ( Located in the state of Maine ). Tiny Toes Rat Rescue of New Mexico ( Located in Albuquerque, New Mexico ). Here, in this article http://ratbehavior.org/WildRatDisease.htm, Dr. Anne discusses the various types of diseases and parasite conditions in the wild rat. This page is always being added to. The Kuddles are constantly finding new sites and items to add. Please continue to check back with us.Thanks.